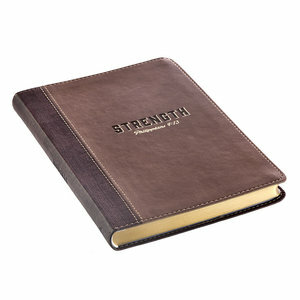 Staying strong through all the bumps along our faith journey isn’t always easy, which is why the brown Strength LuxLeather Journal – Philippians 4:13 makes the perfect gift. You’ll encourage your son, husband, or uncle to rely on the Lord as their source of strength at all times. You’ll subtly remind them how much they need God’s strength. When their strength comes from Him, they can accomplish things in their lives. The brown Strength Journal comes with a foiled LuxLeather cover and holds 240 lined pages with an attached ribbon marker for bookmarking. “Strength” is heat-debossed in all caps in the center of this Christian journal, and the pages are gilt-edged, adding a classic look and feel.